Garmin accessories for the Garmin GPSMAP 751 and GPSMAP 751xs marine chartplotters. All of the GPSMAP 751 accessories available to purchase from ActiveGPS are genuine Garmin parts. All of the Garmin GPSMAP 751 accessories marked as 'in stock' are available today and can be delivered as quickly as the next working day delivery when you choose our Next Working Day Delivery at £9.99. If there is no urgency when you receive your order we offer FREE UK delivery on all orders of £40 or more (delivered typically 3-5 workings days). We also deliver right around the world, prices start from £14.99. please see the basket pages or delivery page for more information. Garmin Transducers and BlueChart marine charts are also available for use with the Garmin GPSMAP 751xs. For further information please click here or scroll down this page past the GPSMAP 751 accessories below. Replacement trim for the Garmin GPSMAP 751 and 751xs chartplotter. Simply snap this trim bezel in place and replace the trim surrounding your GPSMAP 751/751xs. Garmin transducers are fully compatible with the Garmin GPSMAP 751xs and will provide you with a live 'view' beneath your boat. We stock the very latest Garmin transducers which can provide you with an image of not only what lies directly below but towards the front or sides of your boat with features such as SideVu, DownVu and RealVu 3D Forward. To learn more about Garmin transducers please see our Garmin Transducer Buyer's Guide, the page also features an online form, which after completing we will email you a link to compatible transducers that are all fully compatible with your Garmin GPSMAP 751xs and the boat in which you will use both nautical devices on. Find your compatible transducer here. Pictured below, transom mounted transducer, thru-hull transducer and in-hull transducer. By adding either a Garmin BlueChart g3 or g3 Vision marine chart on SD/microSD card to your Garmin GPSMAP 751/751xs chartplotter will provide the detailed digital marine charts on the screen of your device. The larger the chart coverage the more area is covered without the need to change or buy additional charts. We suggest buying the chart(s) that provide the coverage for your sailing, fishing or yachting needs. 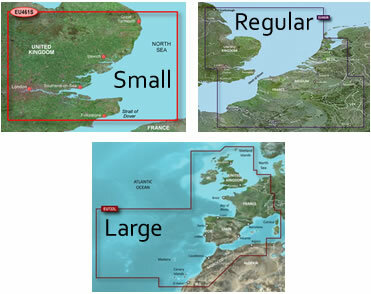 Charts are available to buy from ActiveGPS for the waters around the UK, Western Europe, Mediterranean and North American coasts. Find your Garmin BlueChart.